When you are visiting Florida it is easy to forget its history. It is easy to get lost in cities and beaches and theme parks. However, two hours North of Orlando, the oldest city in the United States sits quietly on the beach whispering of ghost stories and old wars. St. Augustine’s history goes back to the very first European settlers in the Americas. Its stories are as old and tortured as any and the history of Fort Matanzas bears witness to this. 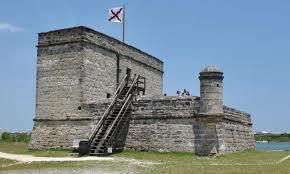 Fort Matanzas is located on Rattlesnake Island just south of St. Augustine. Fort Matanzas’ was closed when we visited. Hurricane Irma had took its toll and the boat that transports visitors to Rattlesnake Island had been shut down and visitors banned. We could not explore its haunted history or see it for ourselves, but its tragedies and ghost stories seem to resonate more because we were banned from going. Although the current Fort Matanzas was built in 1742, its history is much older than that. Matanzas means slaughter in Spanish and there is a reason the fort is named after a slaughter. In 1562, when Spain and France were locked in a battle for Supremacy, King Phillip II of Spain learned that the French, under the leadership of Rene De Laudonniere had established a colony on Spanish land in Florida. The French settlers were Protestants and Spain was the most devoutly Catholic country in Europe. When King Phillip learned the settlers were Huguenots he acted fiercely. After a series of battles and some political maneuvering, over 300 unarmed Huguenots were slaughtered after they failed to convert to Catholicism. A few survived the massacre after converting to Catholicism, but most were slaughtered. Thus the fort built on Rattlesnake Island and the River it guarded were both named Mantanzas after the slaughter. Death followed the Small Island and fort after that. The current Fort, built in 1745, saw many skirmishes and deaths as the land transferred from the Spanish to the British to the Americans. During its brief period of use this stone, Gothic fort was used to house convicts, slaves, and prisoners. After the Americans took the fort it was never used as a fort and quickly fell into disrepair until the National Park Service took over. Now, it is visited by tourists and its dark history is mostly a memory. Those who visit at night, however, see its history in the ghosts that wander the island. They report seeing phantom orbs and strange lights. Faces linger beneath the water and shadows wander the corners of the old fort. Its history still lives there in the phantoms that wander its shores.